This comfortable and well-appointed two storey house, with three bedrooms, still has the appearance of a simple country cottage. 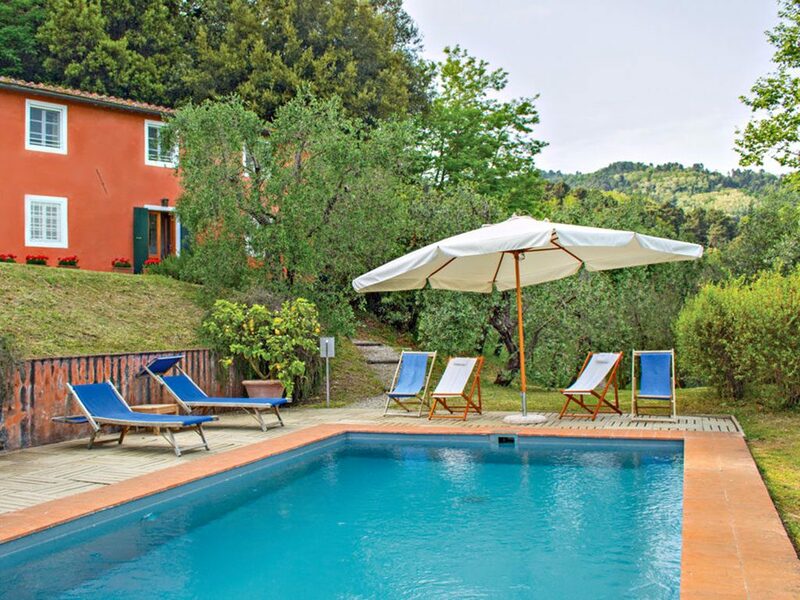 Situated in the hills around Lucca, the house is surrounded by olive groves and forest, which provide privacy without isolation and a panoramic view of the Lucchese valley. Outside there is a dining patio, a pizza oven, a barbecue, a large lawn and an 8 x 4 metre swimming pool. The grounds are equipped with comfortable and attractive garden furniture. The parking area has room for several cars and has two covered parking spaces. The whole property is fenced for security and privacy. Thanks to careful attention to details, and to its cosy feel, the house gives its guests an overall impression of comfort and grace. The small entrance hall opens onto a living room on the left. This room is very comfortably furnished and enjoys an abundance of natural light from the windows that look out over the garden and lawn to the valley below. A fireplace adds atmosphere in cooler evenings. Beyond the entrance hall is a linen room with a washing machine and a small bathroom with a comfortable shower. Right of the entrance hall is the kitchen, which is fully equipped with kitchenware and tableware. The appliances include a dishwasher. The dining tables, in the kitchen and in the living room are next to the large windows and provide diners with views of the garden, the valley and Lucca. The three bedrooms upstairs are pleasantly provided with antique pieces of furniture. The air-conditioned master bedroom, has large windows and a 5-piece double-bedded suite, while the other two rooms have twin beds and large windows with the same splendid views as the rest of the house. There is one bathroom on this floor, complete with bath. Three hours of cleaning on Wednesday. Change of bed sheets and bath towels on Saturday.